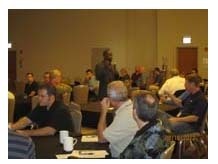 The fourth annual AGC IT Forum Conference kicked off at the Swissotel in Chicago on Thursday, Aug. 16 with more than 225 attendees eager to learn, ready to share and willing to engage. "Where Technology and Construction Converge" was the theme and focused on hot topics, such as interoperability in the cloud, mobile computing, enterprise content management (ECM), affordable solutions and IT trends. James Benham ignited the event on the first day with his exciting keynote presentation on interoperability in the cloud. Benham, founder and president of JB Knowledge Technologies, Inc., stressed the importance of integration. As he noted, other industries are integrating and the construction industry should be as well. "Why can’t we come up with simple de facto standards that exist?" he asked the audience. While agcXML was the industry’s attempt at establishing standards in 2007, adoption unfortunately did not take place. Enter the Construction Open Software Alliance (COSA). According to Benham, COSA is comprised of five small software companies that will work together to create industry standards. Those companies are Cloud Takeoff, eSub, Note Vault, Online Plan Service and SmartBidNet. The captured audience at the AGC IT Forum Conference was the first to hear of this exciting new development. COSA will work to develop quality, robust out-of-the box integration that endorses agcXML standards. Benham stressed, however, that in order to impact change, users must demand integration, participate in the standard and try cloud integrated software. For more information on COSA, readers should visit www.constructionosa.org. 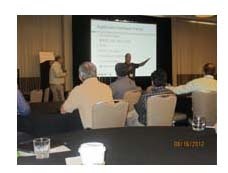 Day one continued with a session on mobile computing: applications and uses on the jobsite. There were two breakout sessions: 1) a large business track moderated by Tomislav Zigo of Clayco, Inc. and 2) a small/medium-sized business track moderated by Tary Carlson, inici group. The last session of the day covered ECM: Strategy, Tools, Implementation. Christian Burger of Burger Consulting, stressed to the IT professionals in the room that ECM is not just a technology, it’s a process. The ECM breakout sessions fell into two categories: 1) companies who were new to the ECM concept, led by Phil Dixon, Viewpoint/Construction Imaging, Jackie Green and Jim Herkert, both of Burger Consulting, and 2) companies who had more experience with ECM, led by Christian Burger and Mark Buckley of Genesis Imaging. The evening wrapped up with a lively networking reception where attendees shared their takeaways from the day’s presentations. On the final day of the conference, an open and productive discussion took place on affordable and workable solutions. The open forum was exciting. Many people contributed to the conversation and fingers were flying on laptops and tablets, as attendees hastily took notes. Mark Reid, IT director, Saunders Construction, said, "This was the session that told me I was returning next year. The open forum allows you to ask questions of 200+ tech professionals who work in different organizations and work on different things." The conference wrapped up with a session on IT trends and an iPad giveaway to one lucky attendee, courtesy of et Alia . The IT Forum Conference could not take place without the support of its generous sponsors: Bentley, CMiC, Computer Guidance, et Alia, Meraki, Pepper Construction, and Sage Software. The conference continues to impress attendees each and every year, and this was no different. AGC looks forward to continuing this tradition in August 2013. Be sure you’re there. Jeanie J. Clapp is editor-in-chief of AGC's Constructor magazine. She can be reached at constructor@naylor.com.